Toll-like receptor 4 (TLR4) of macrophages recognizes LPS of Gram-negative bacteria in cooperation with CD14, which is also involved in the recognition of apoptotic cells. In this study we asked whether TLR4 plays a role in the phagocytic clearance of apoptotic cells by macrophages. Macrophages were prepared from peritoneal fluid of thioglycolate-treated mice carrying either a wild-type or a disrupted TLR4-encoding gene and were examined for their ability to phagocytose apoptotic mouse thymocytes, apoptotic Jurkat T cells, Ig-opsonized mouse thymocytes, Ig-opsonized zymosan particles, and latex beads. Both populations of macrophages equally expressed CD14 on their surfaces and showed almost equal activities of binding to and engulfing all these targets. However, apoptotic thymocytes, apoptotic Jurkat cells, and opsonized thymocytes disappeared more rapidly in TLR4-deficient macrophages than in wild-type macrophages, and the fusion between endosomes/lysosomes and phagosomes containing any target cells or particles was accelerated in mutant macrophages. Activation of the transcription factor NF-κB appeared not to occur in wild-type macrophages after engulfment, and the rate of apoptotic cell degradation in wild-type macrophages remained the same regardless of the activation of NF-κB. Finally, immunohistochemical analyses showed that ectopically expressed TLR4 was associated with phagosomes in a macrophage-derived cell line. All these results collectively indicate that TLR4 negatively regulates the degradation of engulfed cells in macrophages via a pathway independent of NF-κB. Cells undergoing apoptosis are selectively and rapidly eliminated from organisms by phagocytosis (reviewed in Refs. 1 and 2). This process contributes not only to the removal of unnecessary or spent cells, but also to maintaining tissue homeostasis (reviewed in Refs. 3 and 4). Examples of processes involved in the latter function include the following: possible autoantigens (reviewed in Refs. 5 and 6) and proinflammatory substances are eliminated before they leak out from dying cells; production of viral progeny is inhibited when virus-infected cells are phagocytosed by macrophages (7); anti-inflammatory cytokines are secreted from macrophages engulfing apoptotic cells (reviewed in Ref. 8); dendritic cells present Ag that exist in engulfed apoptotic cells (reviewed in Refs. 9 and 10); and testicular Sertoli cells control spermatogenesis by eliminating apoptotic spermatogenic cells (11). Phagocytic clearance of apoptotic cells consists of four distinct steps: accumulation of phagocytes at the site where apoptotic cells are located, recognition of apoptotic cells by phagocytes, engulfment of apoptotic cells, and processing of engulfed apoptotic cells in phagocytes. Among these, only the recognition step has been intensely studied, and candidate molecules responsible for phagocyte binding to apoptotic cells have been proposed (reviewed in Refs. 4 , 12 , and 13). Immunity is central to the self-defense mechanism, which can be divided into the innate and adaptive immune responses. Innate immunity is defined as a mechanism by which self and non-self are discriminated without involvement of proteins encoded by genes that are rearranged during development (reviewed in Refs. 14 and 15). A major role for innate immunity is front-line protection of organisms from invasion by pathogenic microbes: leukocytes directly eliminate invading microbes by recognizing molecules (which are called pathogen-associated molecular patterns) present on the surface of the invaders and activate the adaptive immune response (reviewed in Refs. 14 and 15). Toll-like receptors (TLR)3 are included among the receptors responsible for leukocyte recognition of microbes (reviewed in Refs. 16, 17, 18). Recognition of apoptotic cells by phagocytes does not involve, as known to date, either Ig or TCR, and therefore phagocytic clearance of apoptotic cells can be considered as an innate immune response (reviewed in Ref. 19). However, no substantial link between the two phenomena of innate immunity and apoptotic cell removal has been demonstrated. Macrophages respond to Gram-negative bacteria by recognizing the endotoxin LPS present on the surface of the bacteria, and this recognition requires the presence of both TLR4 and CD14 on the surface of macrophages (reviewed in Ref. 20). It has also been suggested that CD14 plays a role in the recognition of apoptotic cells by macrophages (reviewed in Refs. 4 , 12 and 13). We therefore anticipated that TLR4 might participate in the phagocytosis of apoptotic cells by macrophages. To test this possibility, we examined the phagocytosis of apoptotic cells by macrophages prepared from tlr4-disrupted mice. Mice carrying a disrupted tlr4 in a C57BL/6 background, which neither express TLR4 nor respond to LPS, were generated previously (21). Mice with a normal tlr4 obtained by breeding in our laboratory or C57BL/6 mice purchased from a commercial source were used as the wild-type control. Macrophages were prepared from peritoneal fluids of thioglycolate-injected mice carrying either a wild-type or disrupted tlr4 and were cultivated on coverslips until used as described previously (22, 23). Thymocytes prepared from ddY mice (female, 6–8 wk old) were cultured in RPMI 1640 containing 10% (v/v) FBS at 37°C with 5% (v/v) CO2 in air. They were incubated with 10 μM dexamethasone (Sigma-Aldrich, St. Louis, MO) to induce apoptosis. Jurkat cells, a line of human leukemia T cells, maintained in the same medium as thymocytes were treated with doxorubicin (Sigma-Aldrich; 0.3 μg/ml) for 24–30 h to induce apoptosis. Both dexamethasone-treated thymocytes and doxorubicin-treated Jurkat cells showed features typical of apoptotic cells, including exposure of the membrane phospholipid phosphatidylserine (PS) on the cell surface. To opsonize thymocytes with Ig, dexamethasone-treated thymocytes were incubated with anti-mouse Thy1 IgG mAb G7 (24) for 20 min, and binding of the Ab to thymocytes was confirmed by fluorescence microscopy after treating the cells with FITC-labeled anti-mouse IgG Ab. RAW264.7 cells, a mouse macrophage-derived cell line, were maintained in DMEM containing 10% (v/v) heat-inactivated FBS at 37°C with 5% (v/v) CO2 in air. All experiments involving animals were conducted with the approval of the committee on animal experimentation of Kanazawa University, Takara-machi Campus. Phagocytosis of mouse thymocytes or Jurkat cells by macrophages was examined essentially as described previously (22, 25). Briefly, target cells were mixed with macrophages (at a ratio of 10 target cells to one macrophage) and were incubated at 37°C for various lengths of time. The mixture was first agitated by pipetting and then treated with trypsin to remove target cells that were lightly attached to macrophages. The macrophages that remained attached to coverslips were fixed, permeabilized, and stained with hematoxylin as described previously (25). The numbers of macrophages containing engulfed target cells and of engulfed target cells present in each macrophage were determined by examination under a light microscope, and expressed relative to total macrophages (in percentage; the phagocytic index) and per 100 macrophages, respectively. To determine the efficiency of macrophage binding to target cells, macrophages were incubated with thymocytes or Jurkat cells as described above, fixed without pipetting and trypsin treatment, and stained with hematoxylin. The number of target cells bound to macrophages was then determined by microscopic examination. For examination of the PS dependency of phagocytosis, liposomes consisting of either phosphatidylcholine (PC) alone or a mixture of PC and PS (at a molar ratio of 7:3) were included in phagocytosis reactions at various concentrations (22). The involvement of phosphatidylinositol 3-kinase (PI3K) was examined by preincubating macrophages with 10 nM wortmannin (Sigma-Aldrich) for 1 h before phagocytosis or binding assay. To determine the extent of degradation of thymocytes engulfed in macrophages, the phagocytosis assay was conducted in the presence of 0.1 mM chloroquine (Sigma-Aldrich), an inhibitor of the acidification of endosomes/lysosomes. To examine the phagocytic activity of macrophages against mouse IgG-opsonized and FITC-labeled zymosan particles (zymosan A; Sigma-Aldrich) or FITC-labeled latex beads (Polybead Microparticles; Polysciences, Warrington, PA), macrophages were incubated with target particles, washed with PBS, and fixed. The extent of incorporation of targets was then determined by examination under a fluorescence microscope (BX50; Olympus, Tokyo, Japan). Scores for all the above measurements are shown as the mean and SD of a typical example from at least three independent experiments. The expression of CD14 on the surface of macrophages was examined by immunofluorescence and flow cytometry using anti-mouse CD14 mAb (clone rmC5-3; Research Diagnostics, Flanders, NJ). Unfixed macrophages were first treated with anti-CD14 Ab, then successively with biotin-labeled anti-rat IgG Ab (Vector Laboratories, Burlingame, CA) and Alexa 488-conjugated streptavidin (Molecular Probes, Eugene, OR). They were examined by fluorescence microscopy or flow cytometry (EPICS-XL; Coulter, Hialeah, FL). Macrophages treated with IgG prepared from normal rat serum were similarly analyzed as a negative control. To locate endosomes/lysosomes immunohistochemically, macrophages were successively treated with paraformaldehyde and methanol, and then incubated with Ab recognizing either the endosomal/lysosomal membrane protein LGP85 (26) or the lysosomal enzyme cathepsin D (27). They were then washed, treated with FITC-labeled anti-rabbit IgG Ab (Vector Laboratories), and examined by confocal laser scanning microscopy (LSM510 system; Carl Zeiss, Jena, Germany). Endosomes/lysosomes of macrophages were also detected histochemically under a fluorescence microscope after treatment with cell-permeable fluorochromes, Acridine Orange (Sigma-Aldrich), and Lysotracker Red (Molecular Probes), which accumulate in acidic granules, and Texas Red-labeled dextran (m.w., 70,000; lysine fixable; Molecular Probes), which is actively transported to these organelles. For determination of the activity of the lysosomal enzyme α-N-acetylglucosaminidase, whole-cell lysates of peritoneal macrophages were incubated in 0.1 M sodium acetate buffer (pH 5.5) containing 4-methylumbelliferyl N-acetyl-α-d-glucosaminide (50 nM; Sigma-Aldrich) at 37°C for 30 min. The amount of cleaved substrate was determined using a fluorometer with excitation and emission at 365 and 450 nm, respectively. Macrophages whose endosomes/lysosomes had been loaded with either Acridine Orange (assay A) or Lysotracker Red (assay B) were subjected to a phagocytosis assay with various target cells or particles. In assay A, Acridine Orange-stained macrophages were mixed with unlabeled targets and examined by fluorescence microscopy. Endosomes/lysosomes not fused with phagosomes were stained orange with dimerized acridine orange, whereas those after fusion turned green because the fluorochrome was diluted and converted to greenish monomers (28). The number of macrophages containing fused granules was determined and expressed (in percentage) relative to total macrophages. In assay B, macrophages loaded with Lysotracker Red were incubated with apoptotic thymocytes, apoptotic Jurkat cells, or IgG-opsonized thymocytes that had been labeled with another fluorescent dye, PKH2 (Zynaxis, Malvern, PA), or with unlabeled IgG-opsonized zymosan particles or latex beads. Unfused phagosomes that contained PKH2-labeled target cells were seen in green, whereas those fused with endosomes/lysosomes were seen in yellow due to the coexistence of the two fluorochromes. In contrast, intracellular distribution of unlabeled zymosan particles or latex beads in macrophages was determined by fluorescence phase contrast microscopy, and engulfed target-containing granules existing apart from and being colocalized with Lysotracker Red-labeled endosomes/lysosomes were considered as unfused and fused phagosomes, respectively. The number of fused phagosomes was determined in this way and expressed (in percentage) relative to total phagosomes. Scores in either assay are shown as the mean and SD of a typical example from at least two independent experiments. RAW264.7 cells were transfected with pEFBOS/mouse TLR4flaghis, an expression vector for mouse TLR4 fused with FLAG and His tags (29), by Lipofection using GenePORTER2 (Gene Therapy Systems, San Diego, CA). The resulting cells were incubated with unlabeled latex beads (Ø = 1.053 μm) or apoptotic thymocytes at 37°C for 0.5–2 h. The cells were then successively reacted with anti-FLAG mAb M2 (Sigma-Aldrich),biotin-labeled anti-mouse IgG, and Alexa 488- or Alexia 546-conjugated streptavidin (Molecular Probes), followed by examination under a confocal laser-scanning microscope. Nuclear extracts were prepared from macrophages before and after phagocytosis of apoptotic mouse thymocytes according to the method described by Schreiber et al. (30). As a positive control, nuclear extracts were prepared from macrophages that were incubated with LPS of Salmonella enteriditis (10 μg/ml) (Sigma-Aldrich) at 37°C for 1 h. A double-stranded oligonucleotide with the sequence 5′-ATGTGAGGGGACTTTCCCAGGC, which contains the binding sequence for NF-κB in the mouse κ L chain enhancer, was labeled with 32P at the 5′ ends and used as a probe in an EMSA. The extracts were first incubated with sonicated salmon testis DNA (3 mg/ml) for 10 min on ice and then reacted with the 32P-labeled probe (10 nM) for 10 min on ice. When necessary, after the binding reaction the mixture was further incubated in the presence of anti-NF-κB p65 subunit Ab (sc-109; Santa Cruz Biotechnology, Santa Cruz, CA; 0.2 mg/ml IgG) or anti-C/EBP-β Ab (sc-150; Santa Cruz Biotechnology; 0.2 mg/ml IgG) for 1 h on ice. The samples were loaded onto a 6% (w/v) polyacrylamide gel containing 5% (v/v) glycerol and resolved by electrophoresis at 10 V/cm at 4°C in 25 mM Tris-borate (pH 8.3) containing 0.5 mM EDTA. The gel was dried on DEAE paper (Advantec, Tokyo, Japan), and the signals were visualized using an image analyzer (BAS1000; Fuji Photo Film, Minami-Ashigara, Japan). The effects of the absence of TLR4 on macrophage function of phagocytosing apoptotic cells were examined. To do this, macrophages were prepared from peritoneal fluids of thioglycolate-treated mice carrying either a wild-type or a disrupted tlr4 and were subjected to a phagocytosis assay with mouse thymocytes undergoing dexamethasone-induced apoptosis (Fig. 1⇓A). When the time course was determined with wild-type macrophages, both the relative number of macrophages engulfing thymocytes, i.e., the phagocytic index, and the number of engulfed targets in macrophages increased linearly during the initial stage of incubation, reached a maximum level at 0.5 h, and gradually decreased thereafter. The decrease in the level of phagocytosis at the late stage of incubation is most likely due to degradation of engulfed thymocytes in macrophages, because thymocytes that were smaller in size and more lightly stained with hematoxylin appeared after 2 h (left panels in Fig. 1⇓A). The time course of phagocytosis reactions with TLR4-deficient macrophages was indistinguishable from that with wild-type macrophages until the extent of the reaction reached a maximum. However, the level of phagocytosis, in terms of both the ratio of target cell-engulfing macrophages and the number of target cells engulfed by macrophages, by mutant macrophages was significantly lower than that by wild-type macrophages beyond this maximum point. This was also the case, although less striking, in the reactions with Jurkat T cells undergoing doxorubicin-induced apoptosis (Fig. 1⇓B) or IgG-opsonized mouse thymocytes (Fig. 1⇓C; similar time courses were obtained when the number of engulfed target cells in macrophages was measured). Such effects of TLR4 deficiency were, however, not observed in macrophages that engulfed IgG-opsonized zymosan particles (Fig. 1⇓D) or indigestible latex beads (Fig. 1⇓E). These results suggest that TLR4 deficiency causes rapid degradation of engulfed cells in macrophages. Decrease in the level of phagocytosis of apoptotic cells by TLR4-deficient macrophages at late stages of incubation. Peritoneal macrophages with a wild-type or disrupted tlr4 (TLR4−/−) were used in the phagocytosis assay with mouse thymocytes undergoing dexamethasone-induced apoptosis (A), Jurkat T cells undergoing doxorubicin-induced apoptosis (B), IgG-opsonized mouse thymocytes (C), IgG-opsonized zymosan particles (D), or latex beads (E). The extent of phagocytosis was determined at the indicated times, and the data are shown as the mean ± SD (n = 3–6). Shown on the left in A are hematoxylin-stained, wild-type macrophages that contain engulfed thymocytes at various time points of the phagocytosis reaction, and the arrowheads denote thymocytes that became smaller in size and more lightly stained with hematoxylin. The loss of TLR4 could alter the expression of CD14 in macrophages. We thus immunochemically examined the cell surface expression of CD14 in wild-type and TLR4-deficient macrophages using anti-mouse CD14 Ab. The results showed that there is no significant difference in the distribution (Fig. 2⇓A) or the level of expression (Fig. 2⇓B) of cell surface CD14 between the two macrophage preparations. This indicates that CD14 is not responsible for the observed change in phagocytosis by TLR4-deficient macrophages. We next compared the modes of phagocytosis of apoptotic cells by TLR4-deficient vs wild-type macrophages (Fig. 3⇓). Both macrophage preparations efficiently phagocytosed dexamethasone-treated thymocytes, but normal thymocytes were relatively poor targets (Fig. 3⇓A). The addition of liposomes containing PS, but not those consisting of PC alone, severely inhibited the phagocytosis of apoptotic thymocytes by macrophages regardless of the presence of TLR4 (Fig. 3⇓B). Finally, the addition of the PI3K inhibitor wortmannin inhibited the engulfment, but not the binding, of apoptotic thymocytes by macrophages, and there was no significant difference in the extent of inhibition between the two macrophage populations (Fig. 3⇓C). 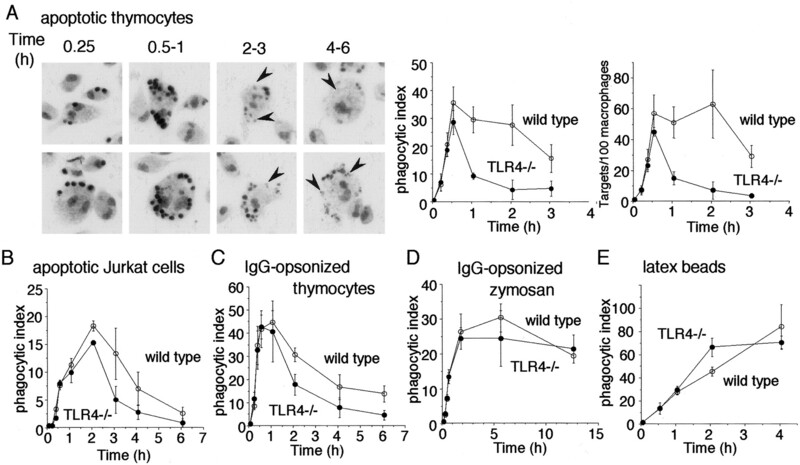 These results indicate that TLR4 deficiency does not alter the mode of macrophage phagocytosis of apoptotic thymocytes, i.e., the dependency on apoptosis induction in thymocytes, the requirement for macrophage recognition of PS exposed on the surface of apoptotic thymocytes, and the requirement for PI3K activity in macrophages. 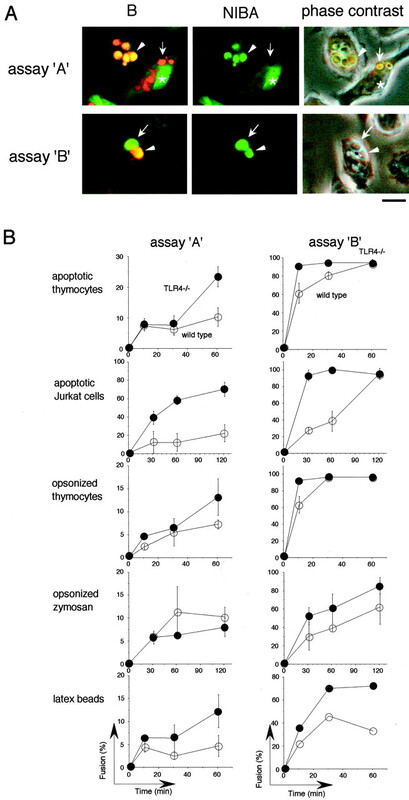 Furthermore, apoptotic thymocytes bound to TLR4-deficient and wild-type macrophages with similar efficiencies (see Fig. 3⇓C). These results indicate that TLR4 deficiency affects macrophage phagocytosis at a step(s) other than recognition and engulfment. No difference in the distribution and level of cell surface CD14 between wild-type and TLR4-deficient macrophages. A, Immunofluorescence. Wild-type and TLR4-deficient peritoneal macrophages were subjected to immunofluorescence using anti-mouse CD14 Ab or control rat IgG. Fluorescence and phase contrast views of the same microscopic fields are shown. The scale bar represents 10 μm. B, Flow cytometry. Macrophages treated with either anti-CD14 or control Ab were analyzed by flow cytometry. Vertical dotted lines indicate the position of peak fluorescence in the analysis with control IgG. No difference in the mode of phagocytosis between wild-type and TLR4-deficient macrophages. Wild-type and TLR4-deficient peritoneal macrophages were subjected to the phagocytosis assay with mouse thymocytes, and the modes of the phagocytosis reactions were compared. A, Dependency on apoptosis in target cells. Macrophages were incubated for 30 min with thymocytes that had been treated (+) or not treated (−) with dexamethasone, and the extent of phagocytosis was determined. The data are the mean ± SD (n = 4). B, Macrophage recognition of PS exposed on the surface of target cells. Phagocytosis reactions were conducted with dexamethasone-treated thymocytes for 1 h in the presence of PS-containing liposomes at various concentrations, and the extent of phagocytosis was determined and is shown relative to that in reactions with no added liposomes. The values obtained for reactions with wild-type macrophages in the presence of control liposomes consisting of PC alone (1 mM) are shown. The data are the mean ± SD (n = 4). C, Requirement for the activity of PI3K in macrophages. Macrophages that had been preincubated for 1 h in the presence (+) or the absence (−) of wortmannin were further incubated for 1 h with dexamethasone-treated thymocytes. Microscopic views of bound and engulfed thymocytes (indicated by arrowheads) are shown on the left. The scale bar represents 10 μm. The numbers of thymocytes attached to (binding) or engulfed by (engulfment) macrophages were determined and are shown relative to the number in reactions with no added inhibitor. The numbers of bound thymocytes (per 100 macrophages) was 30 ± 5 and 36 ± 10 for wild-type and TLR4-deficient macrophages, respectively. The data are the mean ± SD (n = 4). We then tested the possibility that engulfed thymocytes are processed differently in wild-type and TLR4-deficient macrophages. For this purpose, phagocytosis reactions with apoptotic thymocytes were conducted in the presence of inhibitors of endosomal/lysosomal acidification; this allowed us to monitor phagocytosis reactions only up to the step of engulfment. Among three reagents tested, ammonium chloride, chloroquine, and bafilomycin A1, only chloroquine was not toxic to peritoneal macrophages (data not shown). We therefore conducted phagocytosis reactions in the presence or the absence of this drug and determined the extent of phagocytosis (Fig. 4⇓). In the absence of chloroquine, the phagocytic index decreased during the late stage of the time course, and the rate of this decrease was higher in reactions with TLR4-deficient macrophages (Fig. 4⇓A), as also described above. In contrast, inclusion of the inhibitor caused the phagocytic index to persist at a level near the maximum even at late stages of incubation, and the two macrophage preparations did not show a significant difference in this regard (Fig. 4⇓B). These results indicate that endosomes/lysosomes need to be active for TLR4 deficiency to affect the macrophage phagocytosis of apoptotic thymocytes. It seems probable that lysosomal degradation of engulfed thymocytes is accelerated in macrophages that are deficient in TLR4 expression. Abrogation of the effect of TLR4 deficiency in the absence of endosome/lysosome function. Phagocytosis of apoptotic mouse thymocytes by wild-type or TLR4-deficient macrophages was conducted in the absence (A) or the presence (B) of chloroquine, an inhibitor of endosome/lysosome acidification, which was added 1 h before and continued to be present during the reaction. The data are the mean ± SD (n = 6). We next asked whether TLR4 deficiency causes altered distribution and activity of endosomes/lysosomes in macrophages. The intracellular distribution of endosomes/lysosomes was analyzed histochemically using either Ab that recognize endosomal/lysosomal proteins or fluorochromes that accumulate in these organelles. When macrophages were analyzed immunohistochemically with anti-LGP85 or anti-cathepsin D Ab, they gave a staining pattern typical of endosomes/lysosomes in macrophages (31, 32) (Fig. 5⇓A). Endosomes/lysosomes were similarly detected by treatment with the fluorochromes Acridine Orange and Lysotracker Red, which accumulate in acidic compartments, including endosomes/lysosomes (Fig. 5⇓B), or with fluorescence-labeled dextran, which is actively transported to these organelles (Fig. 5⇓C). There appeared to be no difference in the distribution of signals in any examinations between TLR4-deficient and wild-type macrophages. We next examined the function of lysosomes by determining the activity of α-N-acetylglucosaminidase, a representative lysosomal enzyme, in whole-cell lysates of macrophages using a fluorescence-labeled substrate. The level of the enzyme activity was almost the same in lysates of the two macrophage populations (Fig. 5⇓D), indicating that lysosomes in TLR4-deficient macrophages are functionally normal. 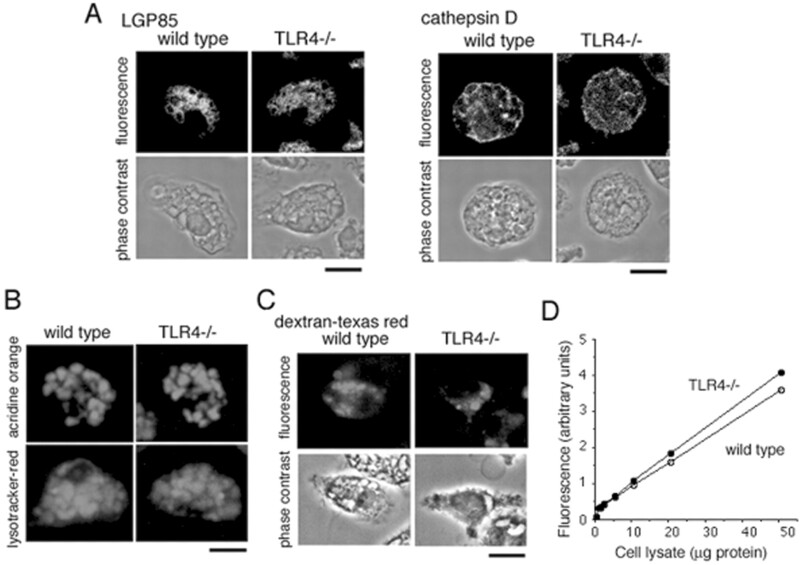 These results indicate that the loss of TLR4 does not alter the morphological appearance or the function of endosomes/lysosomes in macrophages. 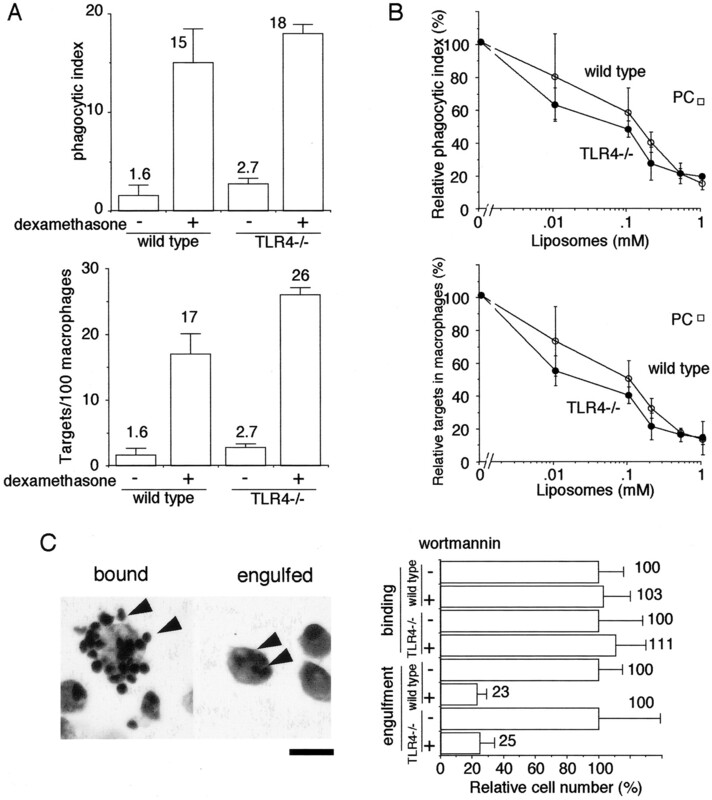 No change in the intracellular distribution and function of endosomes/lysosomes in TLR4-deficient macrophages. A, Immunohistochemical detection of endosomes/lysosomes in macrophages. Macrophages were subjected to immunofluorescence with anti-LGP85 or anti-cathepsin D Ab. Phase contrast and fluorescence views of the same microscopic fields are shown. The scale bars represent 10 μm. B, Detection of endosomes/lysosomes with acidic granule-targeting fluorochromes. Macrophages were treated with Acridine Orange or Lysotracker Red and examined by fluorescence microscopy. Fluorescence microscopic views are shown. The scale bar represents 10 μm. C, Detection of endosomes/lysosomes with an endosome/lysosome-targeting dye. Macrophages were treated with Texas Red-labeled dextran and examined by fluorescence microscopy. Phase contrast and fluorescence views of the same microscopic fields are shown. The scale bar represents 10 μm. D, Determination of lysosomal enzyme activity. The activity of α-N-acetylglucosaminidase was determined with whole-cell lysates of macrophages using a 4-methylumbelliferone-conjugated substrate. We then examined the effect of TLR4 deficiency on the fusion between phagosomes and endosomes/lysosomes in macrophages. For this purpose, wild-type macrophages that had been incubated with endosome/lysosome-targeting fluorochromes were subjected to phagocytosis reactions with apoptotic thymocytes and examined for the occurrence of the fusion in two different assays. In one assay (assay A), macrophages incubated with Acridine Orange were mixed with unlabeled apoptotic thymocytes. In those macrophages, unfused endosomes/lysosomes were stained red, and many phagosomes (indicated by an arrow in the top panels of Fig. 6⇓A) and macrophage nuclei (indicated by an asterisk) were seen in red and light green, respectively, probably due to the adsorption of Acridine Orange. There were some granules stained in green (indicated by an arrowhead), and these were most likely phagosomes fused with endosomes/lysosomes, in which Acridine Orange was diluted and converted from red dimers to green monomers. The number of macrophages containing green granules was determined and expressed relative to total macrophages to indicate the extent of the fusion. In the other assay (assay B), macrophages incubated with Lysotracker Red were fed apoptotic thymocytes labeled with the green fluorescent dye PKH2. These macrophages possessed red endosomes/lysosomes and greenish particles, the latter of which were considered to be phagosomes containing engulfed thymocytes (indicated by an arrow in the bottom panels of Fig. 6⇓A). Fusion of thymocyte-containing phagosomes with endosomes/lysosomes resulted in the colocalization of Lysotracker Red and green PKH2, which caused the fused phagosomes to turn yellow (indicated by an arrowhead). The number of yellow phagosomes was determined and expressed relative to total phagosomes (green plus yellow) to indicate the efficacy of the fusion. 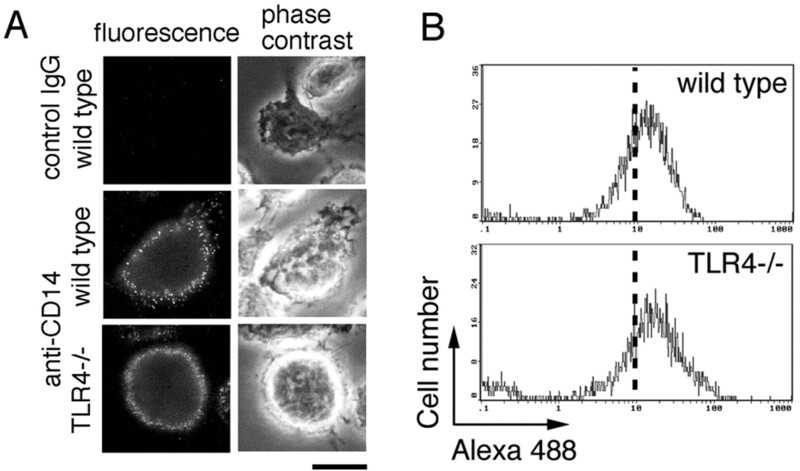 The extent of the fusion was compared in this way between wild-type and TLR4-dificient macrophages during incubation with various target cells, except that in assay B the presence of fused phagosomes was determined by fluorescence/phase contrast microscopy in reactions using unlabeled opsonized zymosan or latex beads as target particles. The results of these two assays almost coincided with each other and showed that the fusion between phagosomes and endosomes/lysosomes takes place more efficiently in TLR4-deficient macrophages than in wild-type macrophages using any target cells or particles (Fig. 6⇓B). We therefore concluded that TLR4 acts to suppress the fusion between phagosomes and endosomes/lysosomes regardless of the type of target cell. This explains why degradation of engulfed cells is accelerated in TLR4-deficient macrophages. Rapid disappearance of zymosan particles in TLR4-deficient macrophages was not obvious, probably because they were only slowly degraded in endosomes/lysosomes. Accelerated fusion between engulfed cell-containing phagosomes and endosomes/lysosomes in TLR4-deficient macrophages. A, Analysis of fusion by two assay systems. Wild-type macrophages whose endosomes/lysosomes had been loaded with Acridine Orange (assay A) or Lysotracker Red (assay B) were incubated with unlabeled (assay A) or PKH2-labeled (assay B) apoptotic mouse thymocytes and examined by fluorescence/phase contrast microscopy. Fluorescence and phase contrast views of the same microscopic fields are shown. Photomicrographs with the terms B and NIBA indicate examinations by fluorescence microscopy with the wavelengths for excitation/detection of 460–490 nm/515+ nm and 470–490 nm/515–550 nm, respectively. The scale bar represents 10 μm. Arrows and arrowheads indicate examples of unfused and fused phagosomes, respectively. An asterisk in the top panels points to the nucleus of a macrophage stained light green with Acridine Orange. B, Determination of fusion in macrophages engulfing various targets. Wild-type (○) and TLR4-difficient (•) macrophages were incubated with the indicated target cells or particles and examined for the occurrence of fusion in the two assays at the indicated time points. The numbers of macrophages containing fused phagosomes in assay A and of fused phagosomes in assay B were determined and expressed as a percentage relative to the total macrophages and phagosomes, respectively. The data are the mean ± SD (n = 4). Binding of LPS, an endotoxin produced in Gram-negative bacteria, to CD14/TLR4 of macrophages leads to translocation of the transcription factor NF-κB from the cytoplasm to the nucleus and thus to activation of NF-κB-mediated gene transcription (reviewed in Refs. 33, 34, 35). We therefore examined whether nuclear translocation of NF-κB occurs in wild-type macrophages after engulfment of apoptotic cells. For this purpose, nuclear extracts were prepared from macrophages either treated or not treated with apoptotic cells and examined for the presence of NF-κB by EMSA (Fig. 7⇓A). When nuclear extracts of LPS-treated macrophages were analyzed as a positive control, a distinct signal whose electrophoretic mobility was slower than that of the free probe was obtained. This signal was shown to be a complex formed between the probe and NF-κB, because a decrease in the intensity of the signal and the appearance of a supershift signal occurred in the presence of anti-NF-κB Ab, but not of unrelated Ab (C/EBP). The DNA-binding activity of NF-κB was present, although at a trace level, in nuclear extracts of untreated macrophages, and its level did not significantly change after incubation with apoptotic mouse thymocytes. We then examined whether NF-κB activity is required for regulation of the degradation of engulfed cells by TLR4. Wild-type macrophages were preincubated for 2 h with dehydroxymethylepoxyquinomicin (DHMEQ), an inhibitor of nuclear translocation of NF-κB (36), and were subjected to a phagocytosis assay with apoptotic mouse thymocytes in the presence of DHMEQ. The inclusion of this drug completely abolished the accumulation of NF-κB in the nucleus of LPS-treated macrophages (data not shown). The level of phagocytosis indexes, however, was not significantly different regardless of the presence of the inhibitor at any time point examined (Fig. 7⇓B). Furthermore, the treatment with LPS, which induces NF-κB activation, did not alter the phagocytic activity of macrophages (Fig. 7⇓C). The results were essentially the same when the level of phagocytosis was determined by measuring the number of thymocytes engulfed by macrophages (data not shown). These results collectively indicate that NF-κB is not involved in TLR4-mediated regulation of the degradation of engulfed apoptotic cells in macrophages. Independence of TLR4 regulation of the processing of phagosomes from NF-κB. A, Detection of NF-κB activity in nuclear extracts of macrophages. Wild-type macrophages were incubated with apoptotic mouse thymocytes or LPS for the indicated lengths of time. Nuclear extracts were prepared from those cells and subjected to EMSA with an NF-κB probe. A digital image of a polyacrylamide gel in which the EMSA reactions were resolved is shown. The two right lanes contained reaction mixtures treated with Ab recognizing NF-κB p65 subunit or C/EBP-β. The positions of free probe, NF-κB/probe complex, and signal shifted by Ab (supershift) are indicated. B, Effect of an inhibitor of nuclear translocation of NF-κB on macrophage phagocytosis. Phagocytosis of apoptotic mouse thymocytes by wild-type macrophages was conducted in the presence and the absence of DHMEQ, which was added 2 h before and continued to be present during the reaction. The data are the mean ± SD (n = 4). C, Effect of LPS on macrophage phagocytosis. Phagocytosis of apoptotic mouse thymocytes by wild-type macrophages was conducted in the presence and the absence of LPS, which was added 1 h before and continued to be present during the reaction. The data are the mean ± SD (n = 4). We finally determined the localization of TLR4 in macrophages after engulfment. As Ab that can be used for immunohistochemical detection of TLR4 in mouse cells was not available, we ectopically expressed epitope-tagged TLR4 in RAW264.7 cells, a mouse macrophage-derived cell line, so that localization of the protein could be determined using an Ab that recognizes the epitope. The epitope-tagged TLR4 was present at the cell surface as well as in areas near the nucleus in macrophages before phagocytosis reactions (Fig. 8⇓A). To determine the localization of the tagged TLR4 in macrophages after engulfment, we used apoptotic thymocytes and latex beads as targets. The results showed that TLR4 was associated with phagosomes containing either target in a macrophage cell line (Fig. 8⇓B). Association of TLR4 with phagosomes. RAW264.7 cells transfected with DNA expressing FLAG-tagged TLR4 were immunohistochemically examined for the localization of the tagged TLR4 using anti-FLAG Ab before (A) and after (B) phagocytosis reactions. Phase contrast and fluorescence views of the same microscopic fields are shown. The scale bars represent 10 μm. A, Examples of cells showing surface (top) and perinuclear (bottom) distribution of the tagged TLR4 are shown. B, Examples of engulfed thymocytes and latex beads are indicated by an asterisk and an arrowhead, respectively. The bottom panels are magnified views of the corresponding top panels. Phagocytic clearance of apoptotic cells may be considered a part of innate immunity. We have provided here for the first time evidence that a molecule that functions in the innate immune response against invading microbes is also involved in the phagocytosis of apoptotic cells by macrophages. As a pattern recognition receptor in innate immunity, TLR4 recognizes Gram-negative bacteria by binding to the endotoxin LPS in cooperation with CD14. As it has also been suggested that CD14 is involved in the recognition of apoptotic cells, we anticipated that TLR4 would play a role in phagocytic clearance of apoptotic cells. Our expectation was that the participation of TLR4, if it occurs at all, would be involved in the recognition of apoptotic cells by macrophages. The results showed, however, that TLR4 plays a role in macrophage phagocytosis of apoptotic cells, not in the recognition step but, rather, in the step of lysosomal degradation of engulfed cells, by regulating fusion between phagosomes and endosomes/lysosomes. It is unclear at present how TLR4 regulates phagosome-endosome/lysosome fusion in macrophages. When TLR4 functions as a pattern recognition receptor in innate immunity, it transduces signals leading to the activation of the transcription factor NF-κB (reviewed in Refs. 35 and 36). However, our results indicate that the regulation of phagosome-endosome/lysosome fusion by TLR4 does not require the activity of NF-κB. Taking into consideration the fact that the lack of TLR4 did not affect the recognition and engulfment of target cells by macrophages, TLR4 is likely to function within macrophages to regulate the degradation of engulfed cells. In fact, we showed that ectopically expressed TLR4 was associated with phagosomes containing either apoptotic thymocytes or latex beads in a macrophage-derived cell line. Another TLR family member, TLR2, has been shown to be present in phagosomes when expressed as an epitope-tagged protein in a mouse macrophage cell line and has been proposed to discriminate between microbes (37). The presence of TLR9 in endosomes/lysosomes has also been suggested, because the macrophage response to unmethylated CpG dinucleotides is abrogated in the presence of inhibitors of endosome/lysosome acidification (38, 39, 40). The association with and action in phagosomes may thus be a general feature of TLR. Our results indicated that the absence of TLR4 causes acceleration in the fusion between phagosomes and endosomes/lysosomes in macrophages engulfing any target cell examined. This suggests that TLR4 is triggered in phagosomes containing various types of targets with distinct surface structures. It is therefore difficult at present to predict the mechanism by which phagosomal TLR4 is activated to regulate the fusion. The physiological consequences of TLR4-mediated regulation of the processing of engulfed apoptotic cells are unclear at the present time. Engulfed apoptotic cells may have fates other than degradation in phagocytes. When virus-infected cells are phagocytosed, the components of engulfed cells are processed, resulting in Ag presentation by dendritic cells (reviewed in Refs. 9 and 10), or viral genes are transferred to the nuclei of macrophages and integrated into macrophage DNA (41, 42, 43). However, the mechanisms by which engulfed materials avoid degradation in phagocytes remain to be elucidated. Apart from the clearance of apoptotic cells, the killing of engulfed bacteria seems to be controlled in phagocytes: some bacteria, when engulfed, inhibit fusion between phagosomes and endosomes/lysosomes and consequently can survive in macrophages (reviewed in Refs. 44, 45, 46). Our results indicate that TLR4 acts to delay the fusion of phagosomes with endosomes/lysosomes. This leads us to speculate that TLR4 is involved in the above-mentioned phenomena by prolonging the lifetime of engulfed materials in macrophages. We previously showed that apoptosis-dependent phagocytosis of influenza virus-infected cells by macrophages leads to inhibition of the release of viral progeny into the culture medium (7). Results from our on-going experiments have indicated that the level of influenza virus production was almost equal when virus-infected cells were incubated with wild-type and TLR4-deficient macrophages (our unpublished observation). Another event that might be influenced by TLR4 deficiency is engulfment-dependent changes in gene expression in phagocytes (47, 48); for example, the expression patterns of inflammation-related cytokines change in macrophages after the engulfment of apoptotic cells (49, 50, 51). Regulation of the fusion between apoptotic cell-containing phagosomes and endosomes/lysosomes might be involved in one or a number of the above-mentioned events; if so, TLR4 might contribute to the innate immune response in one or more ways, resulting in enhanced maintenance of tissue homeostasis. We thank H. Fujita, Y. Tanaka, and M. Himeno for anti-LGP85 and anti-cathepsin D Ab; Y. Nagai and K. Miyake for pEFBOS/mouse TLR4flaghis; K. Umezawa for DHMEQ, D. Takayama for anti-mouse Thy1 mAb G7; and Y. Osumi, N. Mizushima, S. Ohkuma, K. Itoh, H. Fujita, and H. Nakanishi for advice. ↵1 This work was supported by a Grant-in-Aid for Scientific Research from the Japan Society for the Promotion of Science, a grant from the Hayashi Memorial Foundation for Female Natural Scientists, a grant from the Nissan Science Foundation, and a grant from the Hokkoku Foundation. ↵3 Abbreviations used in this paper: TLR, Toll-like receptor; DHMEQ, dehydroxymethylepoxyquinomicin; PC, phosphatidylcholine; PI3K, phosphatidylinositol 3-kinase; PS, phosphatidylserine. Wyllie, A. H., J. F. R. Kerr, A. R. Currie. 1980. Cell death: the significance of apoptosis. Int. Rev. Cytol. 68:251. Ellis, R. E., J. Yuan, H. R. Horvitz. 1991. Mechanisms and functions of cell death. Annu. Rev. Cell Biol. 7:663. Ren, Y., J. Savill. 1998. Apoptosis: the importance of being eaten. Cell Death Differ. 5:563. Walport, M. J.. 2000. Lupus, DNase and defective disposal of cellular debris. Nat. Genet. 25:135. Rosen, A., L. Casciola-Rosen. 2001. Clearing the way to mechanisms of autoimmunity. Nat. Med. 7:664. Fujimoto, I., J. Pan, T. Takizawa, Y. Nakanishi. 2000. Virus clearance through apoptosis-dependent phagocytosis of influenza A virus-infected cells by macrophages. J. Virol. 74:3399. Watts, C., S. Amigorena. 2001. Phagocytosis and antigen presentation. Semin. Immunol. 13:373. Maeda, Y., A. Shiratsuchi, M. Namiki, Y. Nakanishi. 2002. Inhibition of sperm production in mice by annexin V microinjected into seminiferous tubules: possible etiology of phagocytic clearance of apoptotic spermatogenic cells and male infertility. Cell Death Differ. 9:742. Schlegel, R. A., P. Williamson. 2001. Phosphatidylserine, a death knell. Cell Death Differ. 8:551. Henson, P. M., D. L. Bratton, V. A. Fadok. 2001. Apoptotic cell removal. Curr. Biol. 11:R795. Janeway, C. A., Jr. 2001. How the immune system works to protect the host from infection: a personal view. Proc. Natl. Acad. Sci. USA 98:7461. Kaisho, T., S. Akira. 2002. Toll-like receptors as adjuvant receptors. Biochim. Biophys. Acta 1589:1. Underhill, D. M., A. Ozinsky. 2002. Toll-like receptors: key mediators of microbe detection. Curr. Opin. Immunol. 14:103. Greenberg, S., S. Grinstein. 2002. Phagocytosis and innate immunity. Curr. Opin. Immunol. 14:136. Triantafilou, M., K. Triantafilou. 2002. Lipopolysaccharide recognition: CD14, TLRs and the LPS-activation cluster. Trends Immunol. 23:301. Shiratsuchi, A., S. Osada, S. Kanazawa, Y. Nakanishi. 1998. Essential role of phosphatidylserine externalization in apoptosing cell phagocytosis by macrophages. Biochem. Biophys. Res. Commun. 246:549. Fujii, C., A. Shiratsuchi, J. Manaka, S. Yonehara, Y. Nakanishi. 2001. Difference in the way of macrophage recognition of target cells depending on their apoptotic states. Cell Death Differ. 8:1113. Gunter, K. C., T. R. Malek, E. M. Shevach. 1984. T cell-activating properties of an anti-Thy-1 monoclonal antibody: possible analogy to OKT3/Leu-4. J. Exp. Med. 159:716. Shiratsuchi, A., T. Mori, Y. Nakanishi. 2002. Independence of plasma membrane blebbing from other biochemical and biological characteristics of apoptotic cells. J. Biochem. 132:381. Okazaki, I., M. Himeno, T. Ishikawa, K. Kato. 1992. Purification and characterization of an 85 kDa sialoglycoprotein in rat liver lysosomal membranes. J. Biochem. 111:763. Nishimura, Y., M. Higaki, K. Kato. 1987. Identification of a precursor form of cathepsin D in microsomal lumen: characterization of enzymatic activation and proteolytic. Biochem. Biophys. Res. Commun. 148:335. Kielian, M.. 1986. Assay of phagosome-lysosome fusion. Methods Enzymol. 132:257. Schreiber, E., P. Matthias, M. M. Müller, W. Schaffner. 1989. Rapid detection of octamer binding proteins with ‘mini-extracts’, prepared from a small number of cells. Nucleic Acids Res. 17:6419. Káposzta, R., L. Maródi, M. Hollinshead, S. Gordon, R. P. da Silva. 1999. Rapid recruitment of late endosomes and lysosomes in mouse macrophages ingesting Candida albicans. J. Cell Sci. 112:3237. Courret, N., C. Fréhel, N. Gouhier, M. Pouchelet, E. Prina, P. Roux, J.-C. Antoine. 2002. 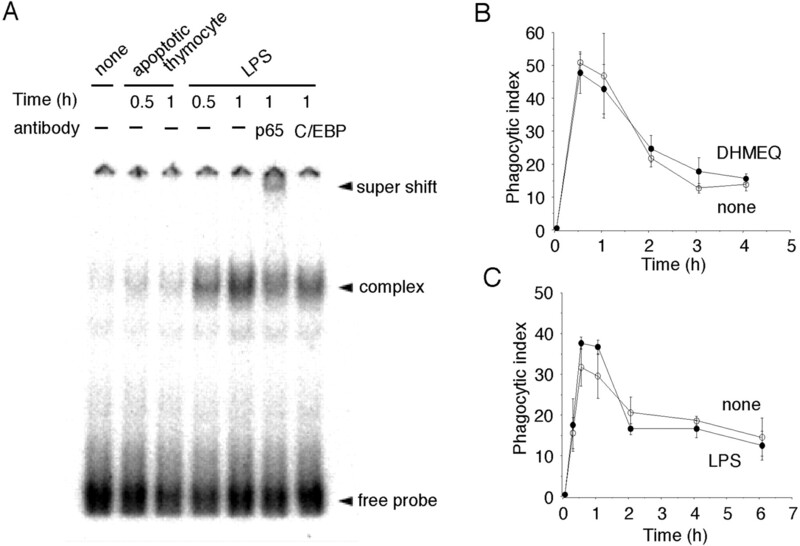 Biogenesis of Leishmania-harbouring parasitophorous vacuoles following phagocytosis of the metacyclic promastigote or amastigote stages of the parasites. J. Cell Sci. 115:2303. Tak, P. P., G. S. Firestein. 2001. NF-κB: a key role in inflammatory diseases. J. Clin. Invest. 107:7. Zhang, G., S. Ghosh. 2001. Toll-like receptor-mediated NF-κB activation: a phylogenetically conserved paradigm in innate immunity. J. Clin. Invest. 107:13. Silverman, N., T. Maniatis. 2001. NF-κB signaling pathways in mammalian and insect innate immunity. Genes Dev. 15:2321. Ariga, A., J. Namekawa, N. Matsumoto, J. Inoue, K. Umezawa. 2002. Inhibition of tumor necrosis factor-α-induced nuclear translocation and activation of NF-κB by dehydroxymethylepoxyquinomicin. J. Biol. Chem. 277:24625. Yi, A.-K., R. Tuetken, T. Redford, M. Waldschmidt, J. Kirsch, A. M. Krieg. 1998. CpG motifs in bacterial DNA activate leukocytes through the pH-dependent generation of reactive oxygen species. J. Immunol. 160:4755. Häcker, H., H. Mischak, T. Miethke, S. Liptay, R. Schmid, T. Sparwasser, K. Heeg, G. B. Lipford, H. Wagner. 1998. CpG-DNA-specific activation of antigen-presenting cells requires stress kinase activity and is preceded by non-specific endocytosis and endosomal maturation. EMBO J. 17:6230. Holmgren, L., A. Szeles, E. Rajanavölgyi, J. Folkman, G. Klein, I. Ernberg, K. I. Falk. 1999. Horizontal transfer of DNA by the uptake of apoptotic bodies. Blood 93:3956. Spetz, A.-L., B. K. Patterson, K. Lore, J. Andersson, L. Holmgren. 1999. Functional gene transfer of HIV DNA by an HIV receptor-independent mechanism. J. Immunol. 163:736. Bergsmedh, A., A. Szeles, M. Henriksson, A. Bratt, M. J. Folkman, A.-L. Spetz, L. Homlgren. 2001. Horizontal transfer of oncogenes by uptake of apoptotic bodies. Proc. Natl. Acad. Sci. USA 98:6407. Sansonetti, P.. 2001. Phagocytosis of bacterial pathogens: implications in the host response. Semin. Immunol. 13:381. Underhill, D. M., A. Ozinsky. 2002. Phagocytosis of microbes: complexity in action. Annu. Rev. Immunol. 20:825. Rosenberger, C. M., B. B. Finlay. 2003. Phagocyte sabotage: disruption of macrophage signalling by bacterial pathogens. Nat. Rev. Mol. Cell Biol. 4:385. Kobayashi, S. D., J. M. Voyich, C. L. Buhl, R. M. Stahl, F. R. DeLeo. 2002. Global changes in gene expression by human polymorphonuclear leukocytes during receptor-mediated phagocytosis: cell fate is regulated at the level of gene expression. Proc. Natl. Acad. Sci. USA 99:6901. Sauvonnet, N., B. Pradet-Balade, J. A. Garcia-Sanz, G. R. Cornelis. 2002. Regulation of mRNA expression in macrophages after Yersinia enterocolitica infection. J. Biol. Chem. 277:25133. Fadok, V. A., D. L. Bratton, A. Konowal, P. W. Freed, J. Y. Westcott, P. M. Henson. 1998. Macrophages that have ingested apoptotic cells in vitro inhibit proinflammatory cytokine production through autocrine/paracrine mechanisms involving TGF-β, PGE2, and PAF. J. Clin. Invest. 101:890. Kurosaka, K., N. Watanabe, Y. Kobayashi. 1998. Production of proinflammatory cytokines by phorbol myristate acetate-treated THP-1 cells and monocyte-derived macrophages after phagocytosis of apoptotic CTLL-2 cells. J. Immunol. 161:6245. McDonald, P. P., V. A. Fadok, D. Bratton, P. M. Henson. 1999. Transcriptional and translational regulation of inflammatory mediator production by endogenous TGF-β in macrophages that have ingested apoptotic cells. J. Immunol. 163:6164.